One of the primary difficulties arising from long days working events is the back or neck strain after carrying tons of gear. From shooting weddings in the past I have found this to be a serious issue with back pain for several days following an event. For this reason, I was very keen to try some new kit to help bear the load. I first saw the HoldFast MoneyMaker at a friend’s wedding worn by the event photographer and luckily he was very happy to chat about his equipment with me. 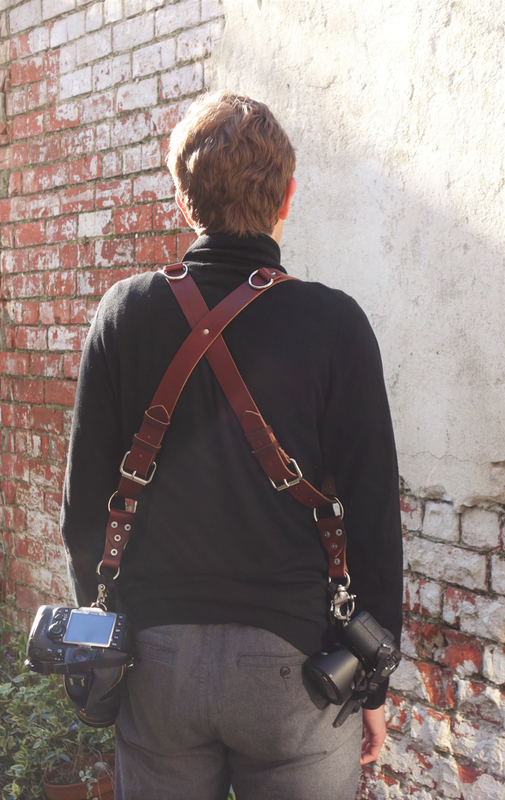 It is designed to spread the weight of two cameras evenly across your shoulders and back and being made from strong soft leather it is also a stylish method to carry your gear. The cameras are held very securely to the harness by a screw in fixture to the tripod mount and a clip to the side lug, they can then slide on the straps to eye level from hanging at the waist. I was fortunate enough to get a MoneyMaker harness recently (great birthday present!) and shortly after I also bought the HoldFast camera leash which uses the same attachment points on the camera so it is very easy to switch between using one camera on the wrist strap and two on the harness. Following my first event using the harness last week where I was photographing open days at Queen’s University I can say I am very impressed! The weight distribution was comfortable and I had no pain or strain after walking around for 5 hours with over 3kg of equipment hanging from my shoulders. NB I’m not being sponsored or pressured into providing this review – I just really like the kit and would whole-heartedly recommend it to anyone in a similar position.